← VanGogh – I want to have you on my phone! When we pick up a camera and frame a composition in the viewfinder, we do so with a number of key assumptions about what happens when we press the shutter button and capture an exposure. A skilled photographer manipulates the exposure, lighting, and point of view to address the fact that the three-dimensional reality in front of them is being translated on to a two-dimensional plane. There are many factors wrapped up into that simple action and when we look at the results, whether it is on the miniature LCD display panel on the back of the camera or as a finely crafted print hanging on the wall in the museum, we suspend our disbelief about the reality of that image. The Michael Snow Photo-Centric exhibit at the Philadelphia Museum of Art is a retrospective collection of work that examines the structure of the photographic medium and what we assume to be true about it. It is an exhibit that every photographer should see, because it artfully and cleverly disassembles the medium in a provocative manner that inspires reflection on contemporary photographic practice. 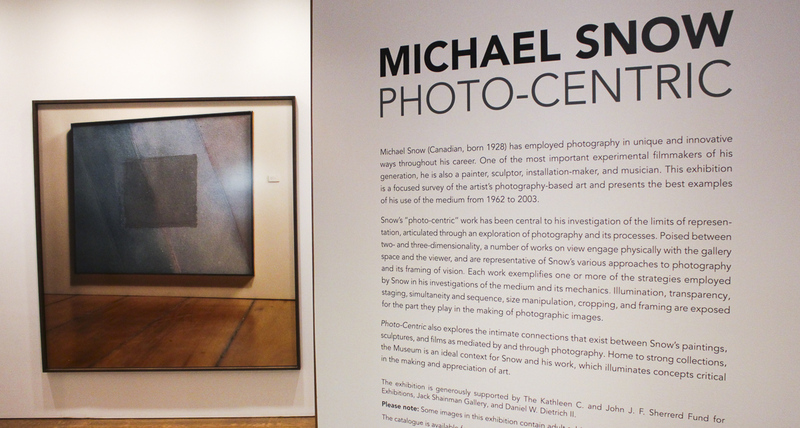 One of Michael Snow’s strategies is to physically take the viewer through the act of the creation of the photograph by forcing them to literally adopt the point of view taken by the photographer. In “Crouch, Leap, Land” it appears that what is on view is a minimalist sculpture consisting of three thin black rectangles suspended from the ceiling, which is the case, except that each rectangle is actually a large transparency of a model in three states of movement: crouching, leaping and landing as shot from below. To see the images completely the viewer has to lie on their back like the photographer who made the images, or at least crouch low as did the depicted model. Some viewers may be shocked to find themselves going from first experiencing a rather straightforward presentation of three black slabs to looking up the underside of a female model. The only way these photographs could have been made would have been with the model standing on a transparent stage, with the photographer positioned below. There are a multitude of components to this work that are uniquely photographic. The most obvious is that of point of view (POV) – cameras are easily raised, lowered, tilted or otherwise placed in unique vantage points that would be difficult to replicate with other media. Beginning photography students are often told to vary their POV and explore the subject from many angles, because that factor can compress the presentation of spatial dimension, expand it or simply make it more interesting. An on-camera flash has clearly been used to freeze the figure in motion – another unique photographic attribute. But Snow goes another layer deeper into the meaning of the medium by getting the image off the wall in a not-so-subtle effort to force the viewer into viewing the scene as the camera viewed it. In addition, the optical limitations of the lens emphasizes just the surface of the glass that the model is standing on, as does the lighting of the model from below, so the effect resembles that of a three dimensional object that has been placed on a copier. The viewer sees a great amount of detail in the feet, but this detail diminishes in the distance. Snow’s approach to making the image seems reminiscent of Eadweard Muybridge’s sequential studies of human movement, such as “Untitled (Woman lying down)”, except that he offers the viewer an unexpected viewpoint that seems like it could be a tongue-in-cheek reference. This work also illustrates the compression of 3D space to a two dimensional plane, which occurs each time an exposure is made. By using the glass as the physical support for the model, Snow has created a surface within the photographic dimension that presses up against the reality of spatial dimensions. For example, the model’s feet flatten out on the glass – the viewer sees this in great detail – and the lighting and focus seem to force the rest of the model’s body to collapse onto the picture plane. This idea of photography carving out slabs of space and compressing it into two-dimensions is a common theme in Snow’s work and is even more dramatically applied in “Press”. The analogy is further reinforced in the presentation of the images, since Snow took the 16 prints and used thick polyester resin as backing to sandwich them between two large sheets of plexiglass, again using clamps to reveal the mechanics of the image creation process. ….when he sandwiched a plant in between a sheet of light sensitized paper and glass, essentially recording a very detailed shadow of the specimen. 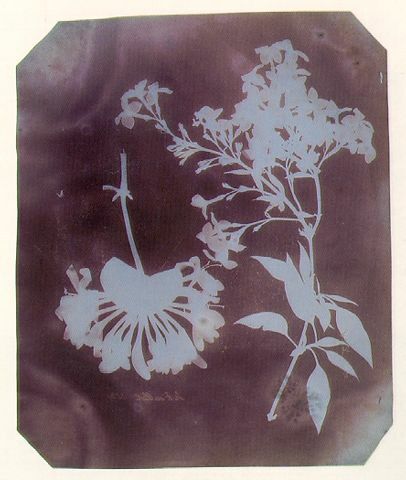 This practice is still used creatively today by many photographers to create “lensless” images called photograms. As Vlas (2014) states in her introduction to the exhibit, “There is a sense of playfulness in Snow’s protracted gesture of literalizing an intangible process, and his visible reflection behind the camera openly declares the artist’s participation – not just as a signature, but also as an invitation to the viewer to indulge in his visual pun” (p. 10). For his part, Snow declares that his intent was to “two-dimensionalize” the objects (Vlas, 2014, p. 54) and he succeeded in doing so in more ways than one. When we look at photographs whether it is in print, website, or in a frame, we suspend disbelief in the sense that we accept that the spatial reality as presented by the photograph represents the real – we are willing to believe that we are looking at a landscape and accept the validity of the image. Yet the photographic process does painfully “two-dimensionalize” space and important information (visual data) is lost in that translation. Perspective, focus, shadow, depth, and detail are all components that are inevitably changed and can be selectively used or hidden based on the photographer’s skill and will. We should keep this factor in mind as we create and interpret photographs. Vlas, Adelina. (2014). Michael Snow Photo-Centric. In P. M. o. Art (Ed. ), (pp. 60). Philadelphia: Philadelphia Museum of Art Publishing Department. This entry was posted in Creativity and Photography, Fine Art Photography, Photo Criticism, Photographic Technology, Photography, Uncategorized and tagged composition, creative process, digital photography, Douglas Barkey, fine art photography, Michael Snow, Philadelphia Museum of Art, photography and culture, photography criticism. Bookmark the permalink.